We're doing our best to do our homework and help you with the math. We've recently gotten a number of questions from photographers and race directors alike asking about the variations between our pricing and our competitors, most notably Backprint, who just announced their closing. We along with a few other websites offer similar services for endurance photography at unique pricing. While one site may seem like a better deal at face value, its difficult to see which sites offer the most functionality, and which offer the best pricing, particularly with the number of features that certain sites do not have, that Flashframe has, and vice versa. We strive to be transparent in everything we do, and in doing so, we are working hard to add as much functionality as possible to be the go-to site with the closing of Backprint. We're working fast to add various prints, and manual tagging into our site, and hopefully, that will be the feature that convinces you to make the switch. Otherwise, we wanted to lay out in a few pictures the differences between our site, Backprint, and Candid. In our example, we're going to assume a race of 1,500 runners, 15,000 photos and a variable sell-through rate depending on platform. This makes a few assumptions, that you upload the same number of photos to each site, and sell the same amount. 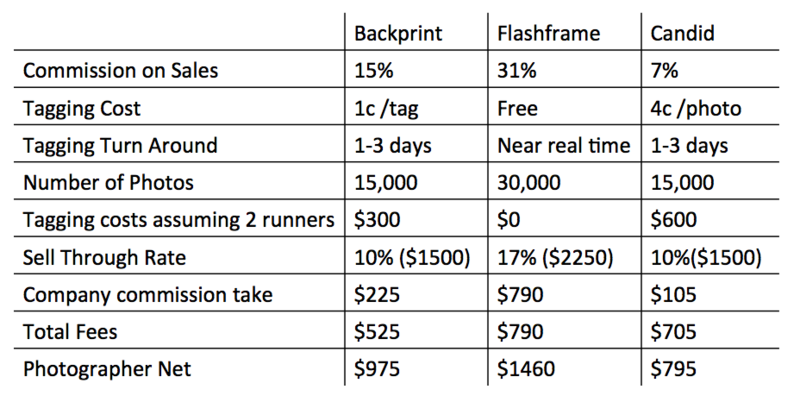 We think this is unfair to the Flashframe platform as you have a number of advantages, most notably that you can take more photos without the tagging cost and capitalize on the quick turnaround tagging. While we do offer a great deal, the only drawback to Flashframe is that we do not let you keep your photos on our site forever. After a year, every month you want to keep 30K photos up has an associated cost of 1/10c per photo. If you have a premium plan you don't have to worry about those storage costs, pending you're under 100K photos. Its also worth noting that you can take advantage of Flashframe's patented color searching algorithms. When compounded with time and position searching it makes for a extremely useful combination, and can eliminate the need for bibs. Finally, Flashframe also has a few advantages in that we are 20% less expensive than Backprint when it comes to sponsored/free photos. While tagging is not free in those situations, we do tag per image, rather than per tag, saving photographers money in the long run. Also, we only charge for situations where tagging is of high confidence, this can lead to a great savings for your photography company and race. While we may not have every feature you're looking for right now, in time, we strive to have as many as possible that fit within the Flashframe business model. If you have any questions, please do not hesitate to reach out and we'd be happy to see how we can best get that feature into our long term plan!